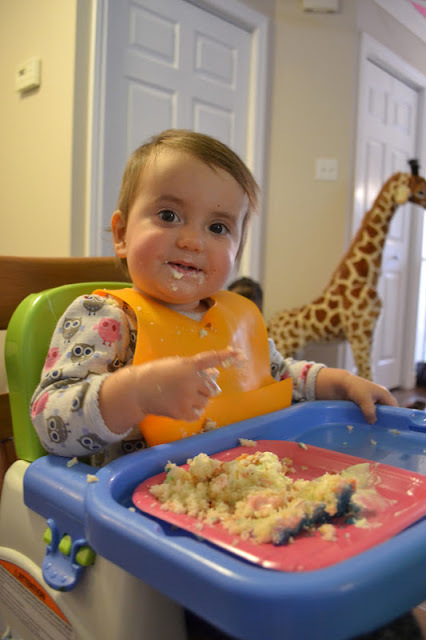 Canadian Home Love: Paisley is One! Boy has it been far too long since I've written a post. For some reason it is more effort to write one the longer I wait. I suppose there's no better reason to get back at it than Paisley turning one! We had a birthday party for her last Saturday and it was exhausting, making it that much more confirmed that we will NOT be doing a big party every year. It was really spurred by the fact that our families were traveling a long ways to come, so of course we had to put a good amount of effort into it. It turned out great and Paisley did really well considering we had 18 adults and 13 kids 3 and under (!) in our little house! Sweet owl cupcakes. Thanks Pinterest! Mama's homemade banner. Maybe it could be reused every year? It was chaos, but in a good way!